Allie Wilson made history when she placed fourth in the women's 800-meer run in 2:04.12 at the NCAA Division 1 Championships on Saturday at the Birmingham CrossPlex in Birmingham, Alabama. 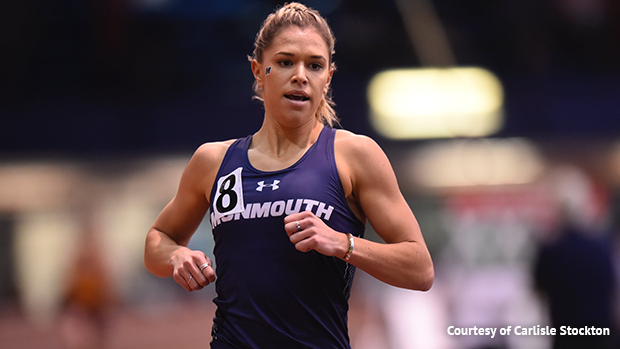 With her fourth place finish, Wilson became the first female from Monmouth University to ever earn First-Team All-American honors at the NCAA Indoor Championships. Wilson joins Monmouth Hall of Famer Tisifenee Taylor (fourth at in the long jump at the 2007 NCAA Outdoor Championships) as the highest female finisher ever for Monmouth at an NCAA Championship meet. Wilson, a senior out of Strath Haven High School in Pa., qualified for the NCAA Championships when she ran a school record 2:02.65, the No. 2 time in the NCAA this season, at the Valentine Invitational last month at Boston University. Alyssa Wilson of UCLA, a sophomore out of Donovan Catholic, placed fourth in the women's shot put with a mark of 57-0 1/4 and was ninth in the weight throw with a 68-10. Wilson is the national high school record holder in the shot put, indoors and outdoors. Senior Joe White of Georgetown (DePaul) placed sixth in the men's 800 in 1:48.19. Indiana senior Eric Bethea (Piscataway) finished 11th in the men's triple jump with mark of 51-6 1/2. Junior Amari Onque-Shabazz (Union Catholic) split 54.74on the 400 leg to help Villanova place fourth in the women's distance medley relay in 10:56.04, the third fastest indoor DMR in Nova history. Michigan junior Andrew Liskowitz (Christian Brothers Academy) finished 13th in the men's shot put with a throw of 62-11 1/4.